We got up and went in search of food, which lead us back to the truck stop. We ran into a couple of Trans Am racers also having breakfast and made sure they knew to stop at Newton Bike Shop. They had stayed at the motel, but not without fighting to get a room. 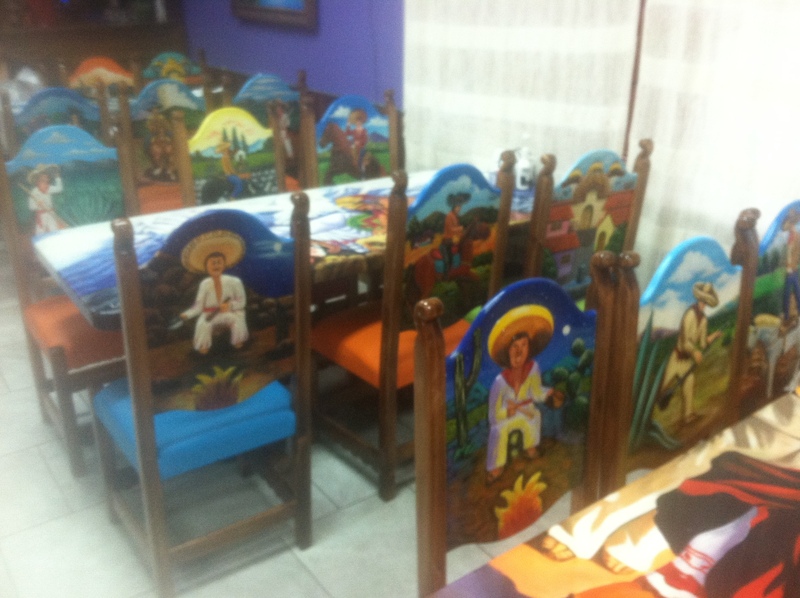 Again, due to harvest time, there were no rooms, but the owner was able to find a room for them last minute. We knew it would not be a long ride today and we were looking forward to getting to Colorado. We started on our way but the biting flies would not leave Linda alone. It got so bad that when Linda stopped to put more bug spray on, they attacked her even more due to the lack of wind. Linda started screaming in frustration because they were all over her. It felt like a horror movie. “Attack of the flies” or something. Phil tried to help and started trying to swat them away with the large orange flag he had picked up. It created quite a spectacle on a regularly traveled road and someone with a pick up truck pulled over to see if we were okay and if we needed a lift. Linda graciously accepted an indoor respite from the evil blood sucking flies. The gentleman told us the flies are especially bad after a rain and that they should get better once the wind picks up a bit. There is no bug spray that works for them either. 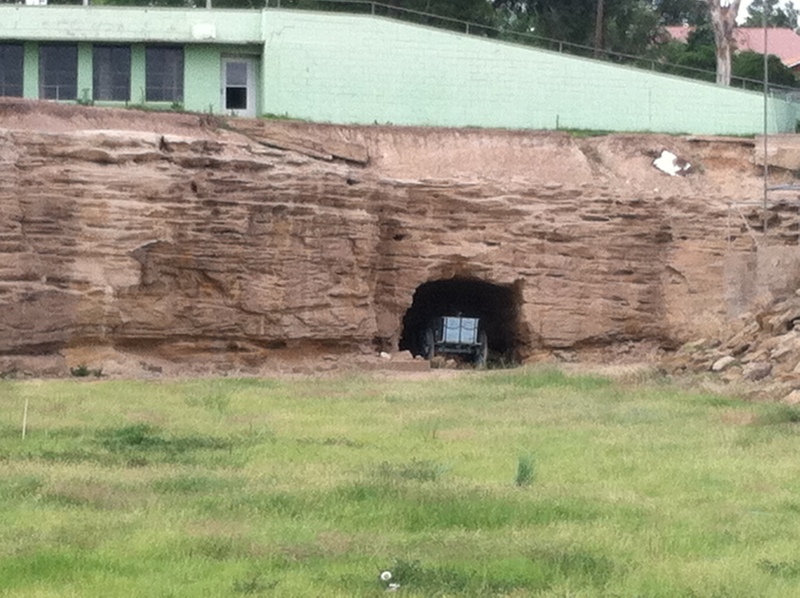 He was a worker headed to a farm right at the Colorado/Kansas border, so he took us there, a total of 8 miles. Once we got to the border, we unloaded the bikes and by that time the wind had in fact picked up a bit, making the flies a little more bearable. We celebrated arriving to a new state. 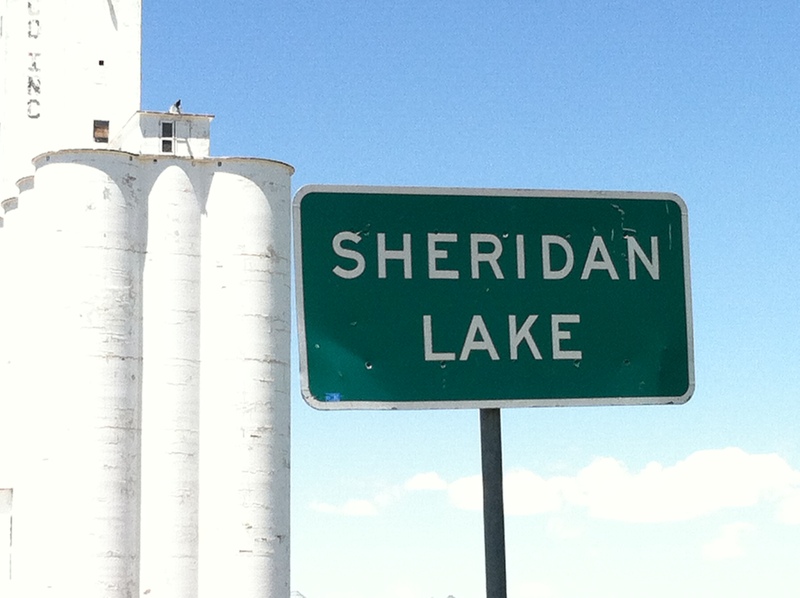 It was only a few more miles to Sheridan Lake, where we had heard there was a nice church to stay at. 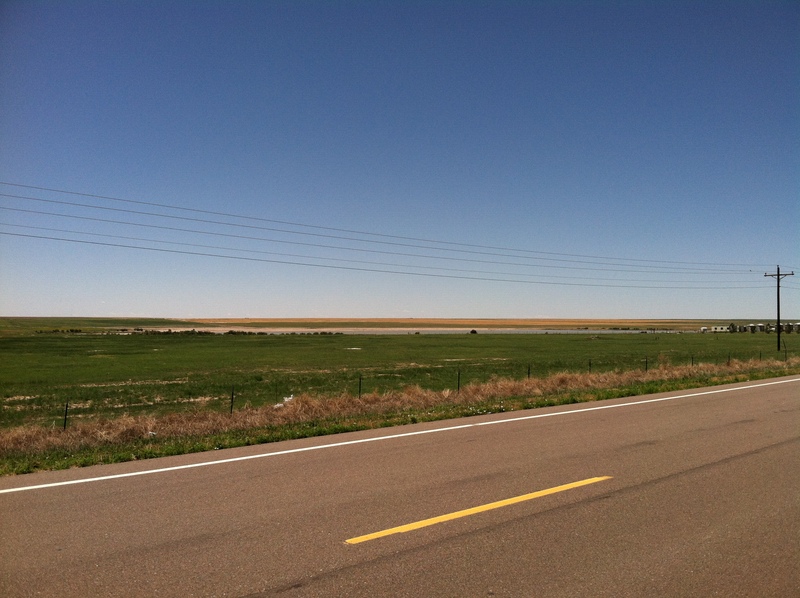 Eastern Colorado looked a whole lot like western Kansas: Flat for miles with nothing but wheat fields. We arrived to Sheridan Lake and there had been enough rain this season so there was actually water in the lake there. We found the only convenience store in town (actually the only business in town). Sheridan Lake was noted on our maps to be ~100 people, but locals said it was more like 68 people. We got directions to the church as we had no phone signal or 3G network. It was easy to find and the door was open. We looked around to see if anyone was around and then a little girl appeared what seemed to be out of nowhere. She introduced herself as Victoria and asked if we were cyclists. We said yes and she started to show us around, since her Dad (the pastor) was out of town right now. She let us know where we could sleep and that we had to leave our bikes outside. Apparently, they used to let cyclists bring their bikes in and then someone decided to grease their bike chain in the nursery and left a huge stain. We were stunned someone would be that irresponsible and ignorant. We eventually met her older brother, who was careful to make sure we were being given enough space. 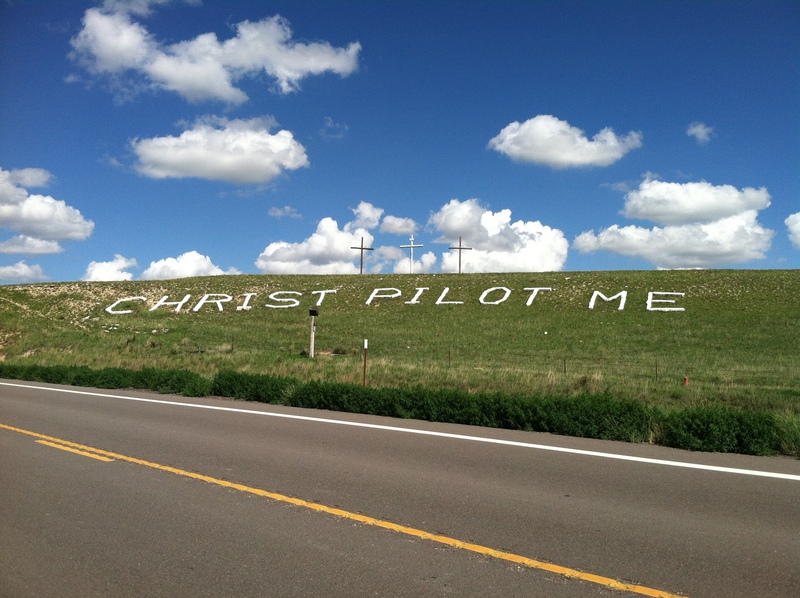 At this point we knew we would be stopping in Laramie and not continuing our journey to the west coast. We had wifi at the church and we were able to contact Mom and Dad to let them know of our plans andso they could start sending packages before they left on vacation. Linda needed to also contact the UW apartments to make sure everything was squared away and felt better calling instead of emailing to get answers right away. The pastor’s wife was nice enough to let me use her phone to make those calls. We enjoyed everyone’s company there, as Phil felt a little nervous being so far away from civilization in such a small town. Being around people helped to calm his nerves. We took one more trip down to the store to get some food and got some great homemade ice cream too. We got up leisurely and had a great breakfast at the hotel. We then eventually got on our way. We saw our first windmills in the distance. We arrived in Leoti, KS and took got some lunch at a local convenience store which actually had some great mexican food. After filling our stomachs, we knew that our next town we wanted to make it to had very little services. We stocked up at the local grocery store which was only 2 blocks away from our lunch stop. We then continued onto Tribune, KS. A few miles outside of Tribune, Linda heard her phone ding, which sounded like a a weather alert. 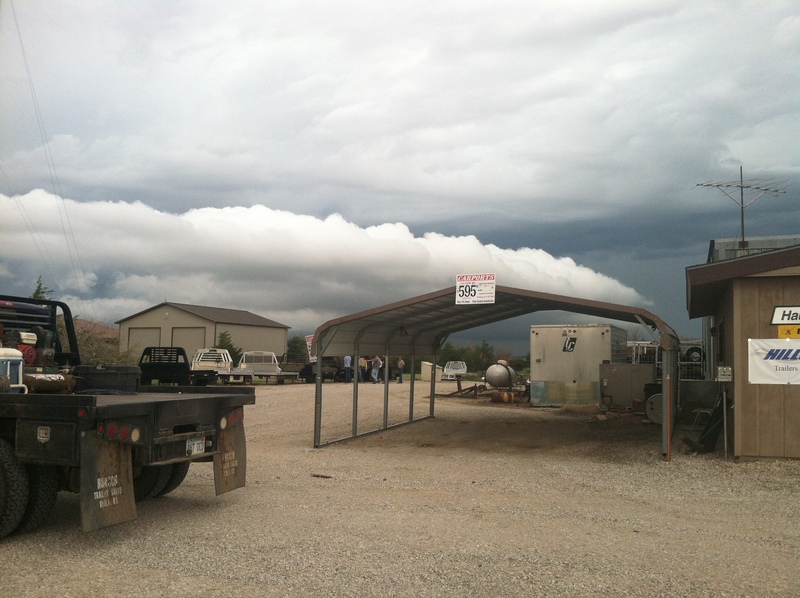 The sky was telling us that there was something brewing and when we arrived in Tribune, we stopped at the truck stop there. 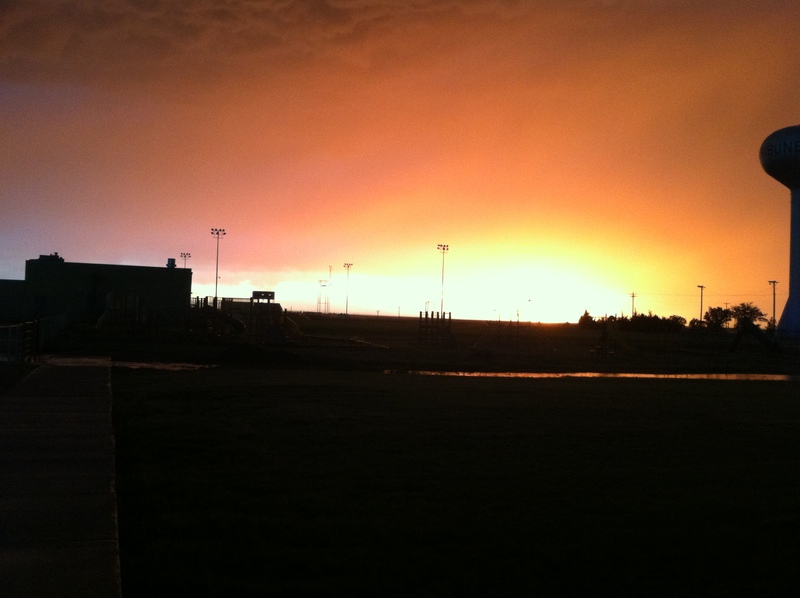 Sure enough there was a tornado watch until 9:00 that evening. 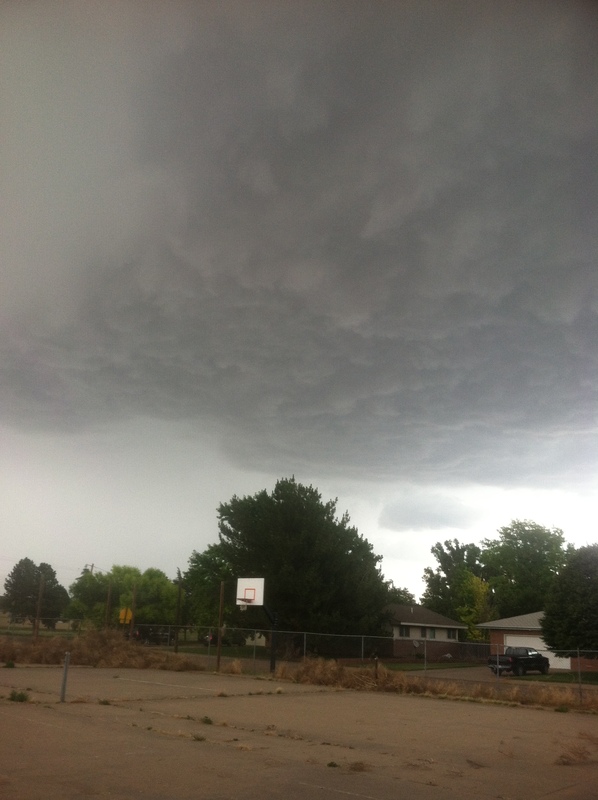 Go figure, 16 miles from the Colorado border and we get our first Tornado watch. 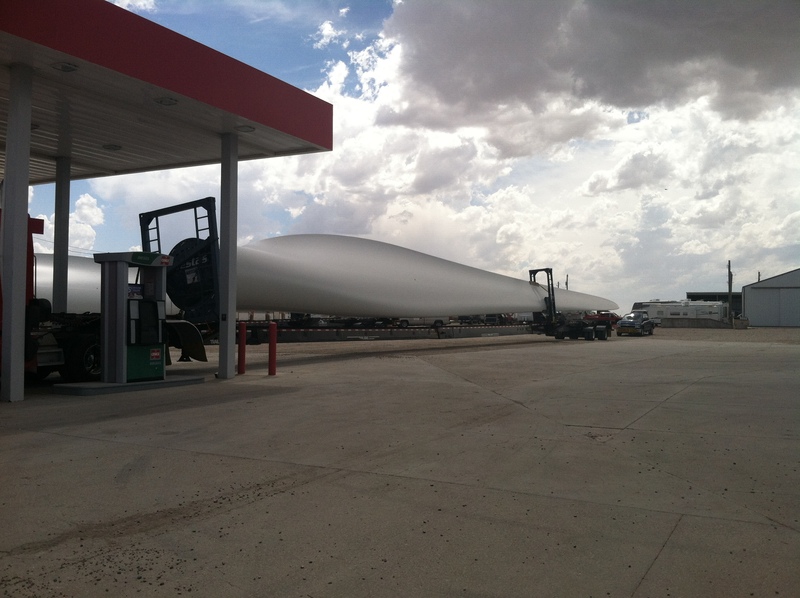 We got to see huge oversized trucks at the truck stop, carrying exactly what we had seen eariler: windmills. That is one wing of the windmill. Phil found out that the back tires of these huge rigs were actually operated by the pick up truck driver who drove behind. It was pretty incredible and made us feel pretty small. We got a bite to eat at the truck stop. Phil struck up conversation with some people there and Linda inquired about lodging with some of the local ladies that were there. Linda was advised that we did not want to stay in the only motel in town. It was right across the street and we could tell it didn’t look fabulous. They recommended the city park over the motel, however Linda asked if there was anything indoors due to the approaching storm. 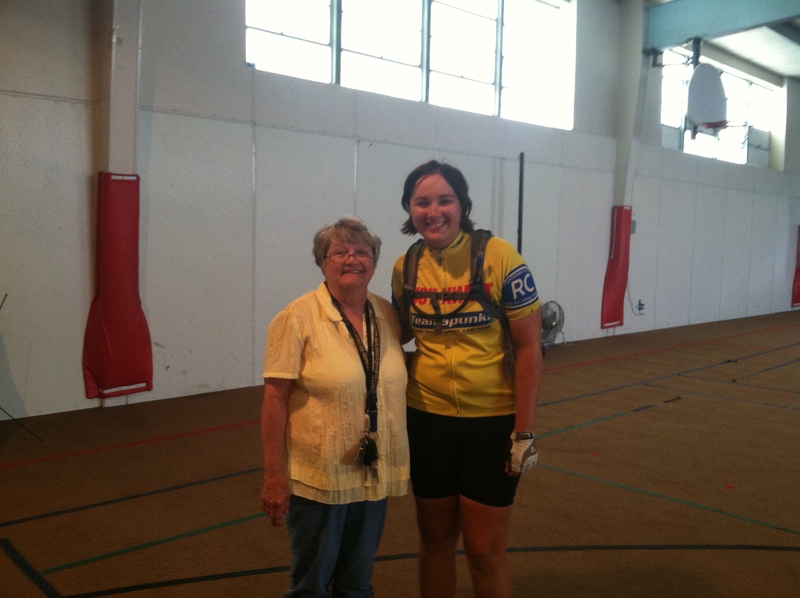 One of the ladies spoke up and said the Presbyterian church kept it’s doors open for cyclists. Another lady told Linda to hold on and let her call her boss. She worked over at the school as a janitor and was willing to go over and open the “Blue Gym” and have us stay there. She said there were showers and laundry there and most importantly, a roof. Once she cleared it with her boss, she had us follow her over to the school just as it started to rain. We then waited there for her to get her keys. She came back and opened the gym for us. It was very warm in the gym and she told us the chuch wouldn’t have been much better (she knew that because she cleaned over there too). We were very thankful. We showered and did laundry. 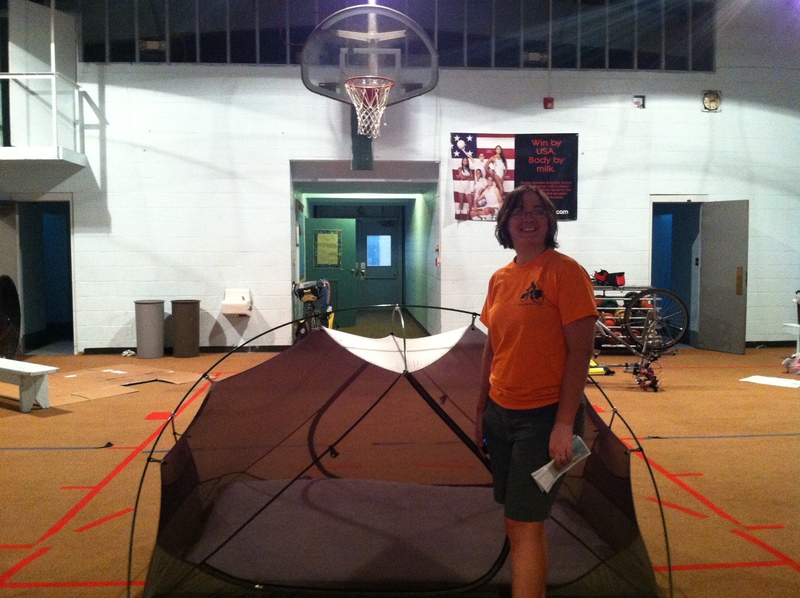 We set up our tent anyway in the gym. To combate the heat, we opened all the door which also let the horrible biting flys in. And they bite HARD. The tent kept them off of us. The tornado watch expired at 9:00pm, however there was still a lot of Severe Thunderstorm watches and warnings for most of the night. As it continued to get darker, the storm raged on providing quite a light show almost all night. It was incredible. We were again, so thankful for the shelter. Linda woke around 3:30am due to an weather alert on her phone. She had downloaded a weather app after Ness City that let her know how close lightening was to the area. It was a yellow alert, lightening was over 20 miles away and to be aware of where you could take shelter. We had let the sheriff know we were camping in the park, so we figured if there was any threat, we would be alerted to it. Linda continued to rest and let Phil sleep. Around 4:00 the lightening alert turned from yellow to orange, indicating lightening between 10-20 miles away. Linda woke Phil to let him know and we tried to decide whether the pavilion was “adequete shelter.” As the wind picked up, Linda checked again and sure enough the alert had gone from orange to red indicating lightening within 10 miles meaning it was time to seek indoor shelter. We packed up quicker than we ever had, but by the time everything was away the bikes packed the storm was right on top of us. Wind was blowing rain through the pavilion and we called the sheriff’s office. They sent a police car to get us. We left all our stuff and he took us to the sheriff’s office which was also the courthouse. We then realized how hungry we were and had not thought to bring a snack. It was now 5:30 in the morning and we knew the Kwik mart only a couple blocks away was open. We waited for the downpour to stop enough so we could run over to the Kwik Mart to get some food. We stayed there for a while, waiting for the storm to pass. It finally did and we went and got our bikes at the park. There were large water puddles that were hard to jump over at some intersections. For an area that has been in drought for about 5 years, the locals were thankful. We got a lot of comments from locals about if we had gotten wet in a friendly, teasing manner. Someone also let us know they had just came from Ness City and saw a couple of cyclists with bags coming west and getting very wet. We were hopeful we could meet up with them. We left Dighton around 9:30am and continued to Scott City, KS. 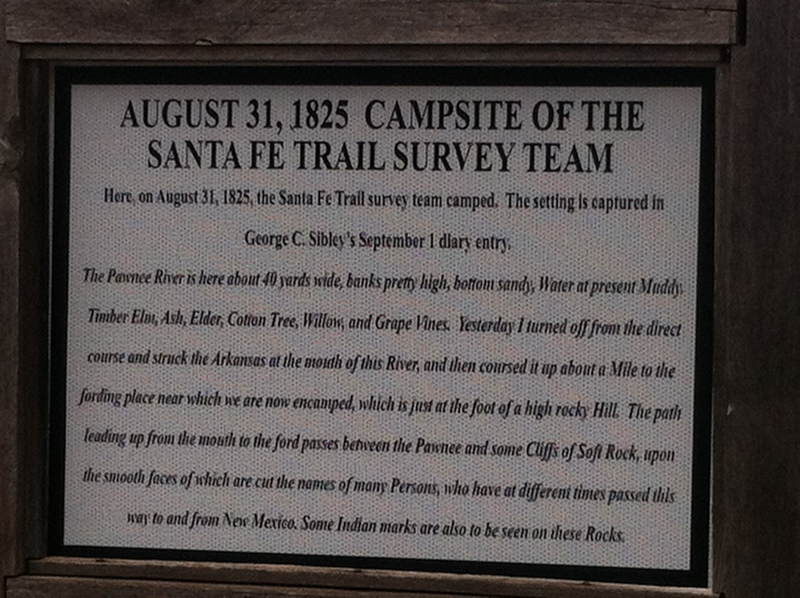 Despite the lack of sleep, we did pretty well and got to Scott City around mid-day. There was an airport right before town and Phil wanted to check it out. We arrived there just in time as they were having a educational session for some kids on flight simulator. We were there for only a little while when Phil spotted two touring cyclists coming up the road. Linda had grabbed some food, so quickly packed up her bag again and raced off after Phil to catch the other touring cyclists. We finally caught up with them midway through town at a convienience store. They were a retired couple that had lived on the east coast for most of their life and had just recently moved to Arizona. They were taking as long as they wanted for this tour; they had the time. They were staying the night at a hotel and prefered to stay at hotels. They had really brought a tent for worst-case-senerios, which we were starting to really appreciate hotels at this point. We looked around for some motels, but Linda really wanted to stay at the Best Western even though it was more pricey and the farthest off the route. Linda wanted to get sleep and have all the creature comforts. Plus, they were running a special: Stay 3 nights get one free. After getting some lunch, we finally decided to head to the Best Western and got one of their last rooms: the King suite. We weren’t thrilled about the price, but happy to have a nice bed and a place to do our laundry. The hot tub wasn’t bad either. We left Ness City (again) still relatively late. 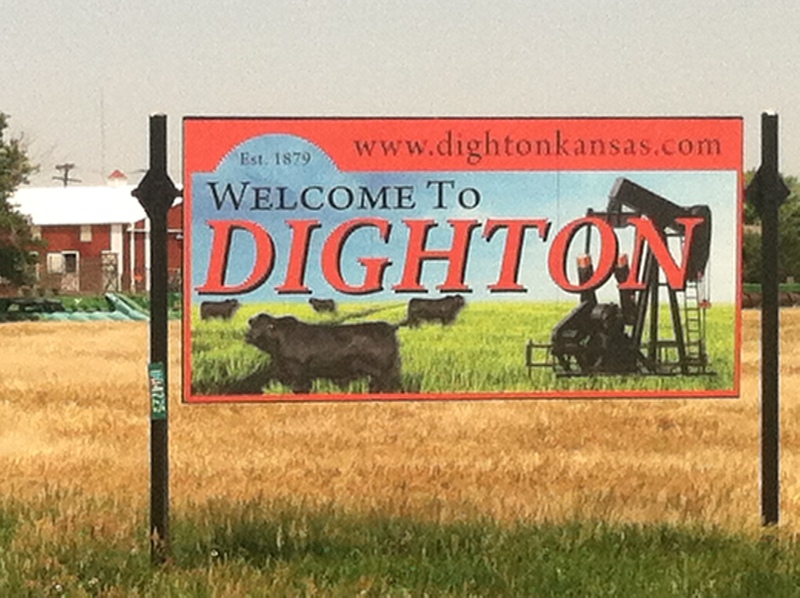 We made it to Dighton, KS around mid-day. 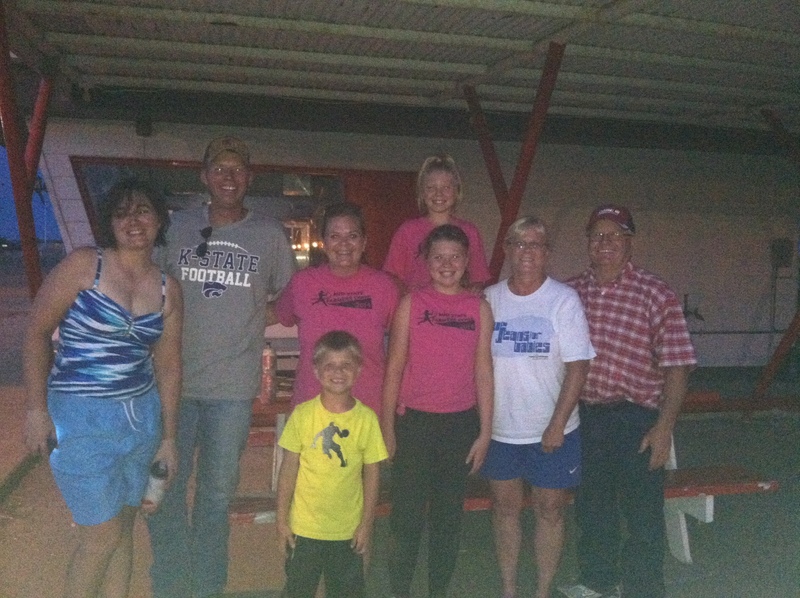 The first place we found was a dairy bar and we met some great folks there. We spent some time there in the shade and then got directions to the city park/pool. Phil really wanted to go swimming at this point and it didn’t take too much to convince Linda. We had a nice time at the pool it cooled us off quite a bit. We checked out the park for good camping spots and there were a few nice pavilions to camp under. We were just worried about staying there due to our previous experiences with city parks. 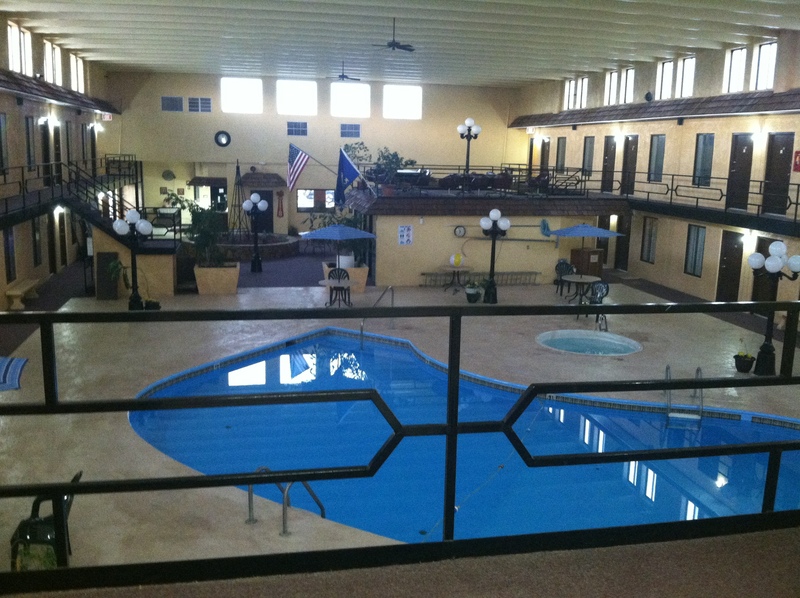 We went back to town again for some more food and check out our other lodging options. We decided it was a little late in the day to continue on to the next town. We found out that the only hotel was booked due to the harvesters in town. We also asked the woman who owned the dairy bar if we could camp in her yard. She said that would be fine and she lived conviently right next door. She had lived in Dighton her whole life and loved it there. She had worked at the dairy bar when she was younger and now she owned it. Linda then went back to the pool before they closed to take a shower. It started to get late and the bugs were starting to come out. We realized it might be more quiet in the park due to her property being on a major road so we thanked her and left for the park. We set up our tent right under the pavilion and we knew there was a slight possibility of a storm overnight. 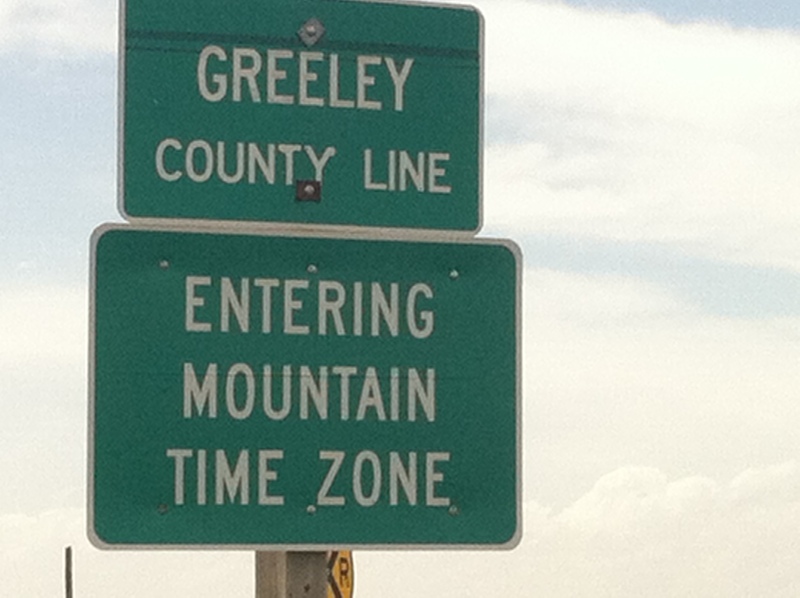 We have decided to end Part 1 of our two-summer cross-country bike tour in Guffy Colorado because we were having a hard time adjusting to the altitude change. Another reason for ending sooner than we planned is because of our slow pace and we were going to run out of time before we had to be at UW. With this being our first real bicycle tour, we’ve learned a heck of a lot. As a two-time cancer survivor, Phil feels good about our trip and looks forward to finishing the rest of the TransAm another summer! 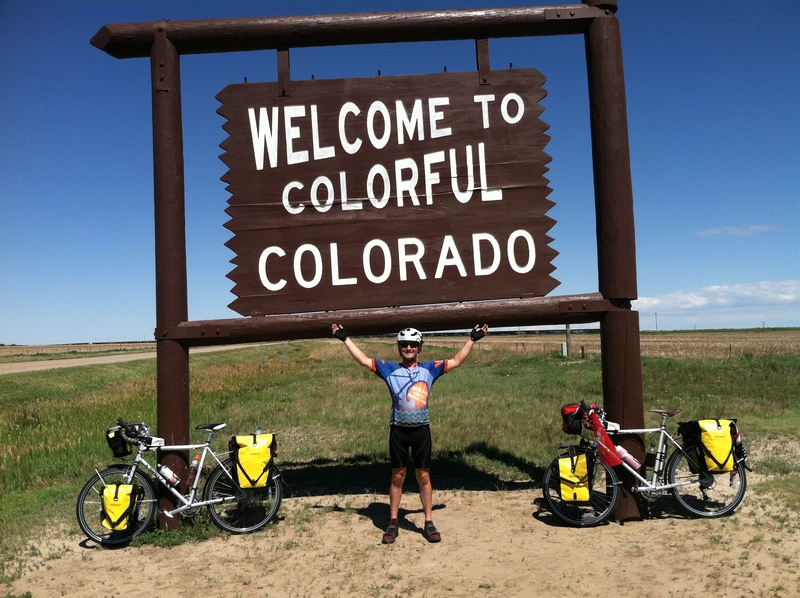 All of the touring cyclists that we met along the way were super cool folks and we look forward to meeting lots more cool folks when we continue the TransAm another summer. We truly appreciate everyone that we met along the way!!! 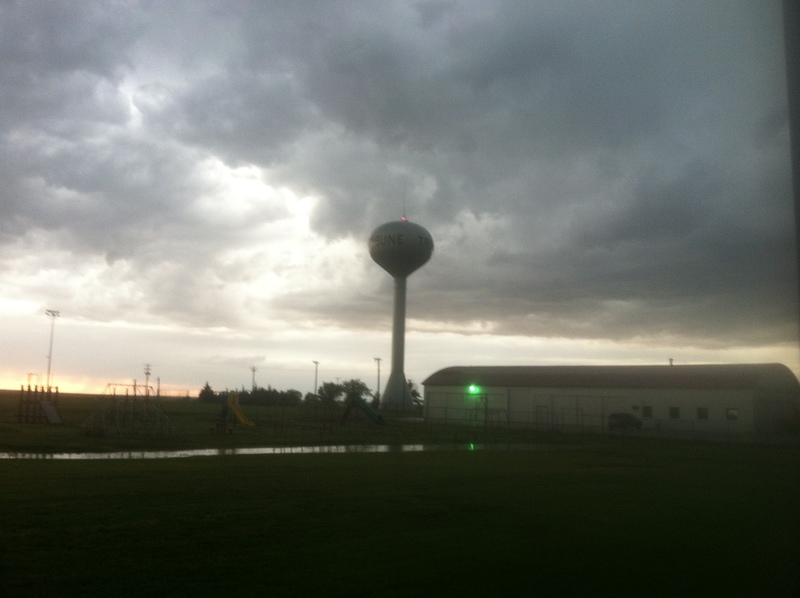 We left Larned and there was quite a cross wind. It would be another 60+ mile day, but there was a town half way in between so we knew we’d have a break. A few miles out of town was Fort Larned National Historic Site. We took a picture, but it didn’t look like there was much more there except picnic tables. After 14 miles we finally turned north and enjoyed a 19 mile tailwind to Rush Center. In Rush Center there was a single restaurant that we would have missed if we hadn’t seen another touring bike alongside the building. 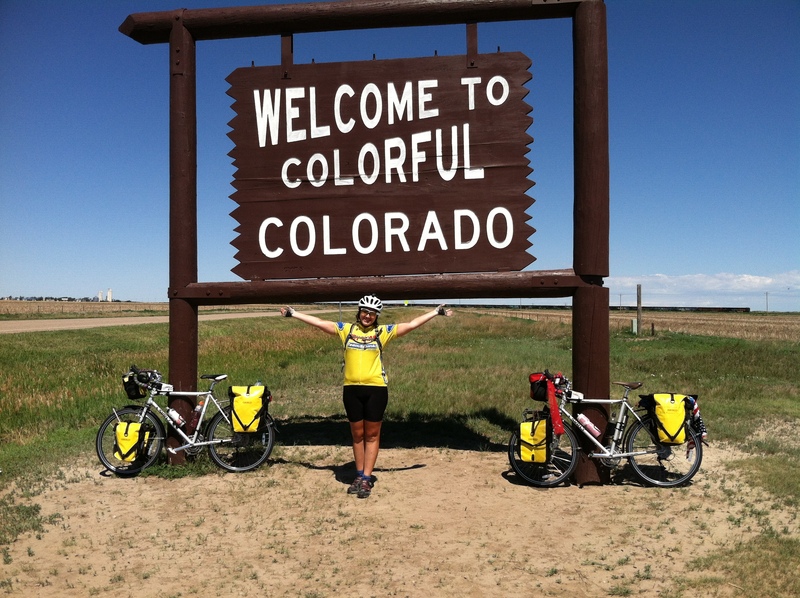 We spoke with the other cyclist who was headed east and compared notes of what was ahead. We grabbed some lunch at the bar and Phil entertained the waitresses with his jokes. We passed by Alexander, KS where you could camp at the rest stop. Apparently the rest stop is always open with bathrooms. This also marked the end of map 8 and the beginning of map 7. 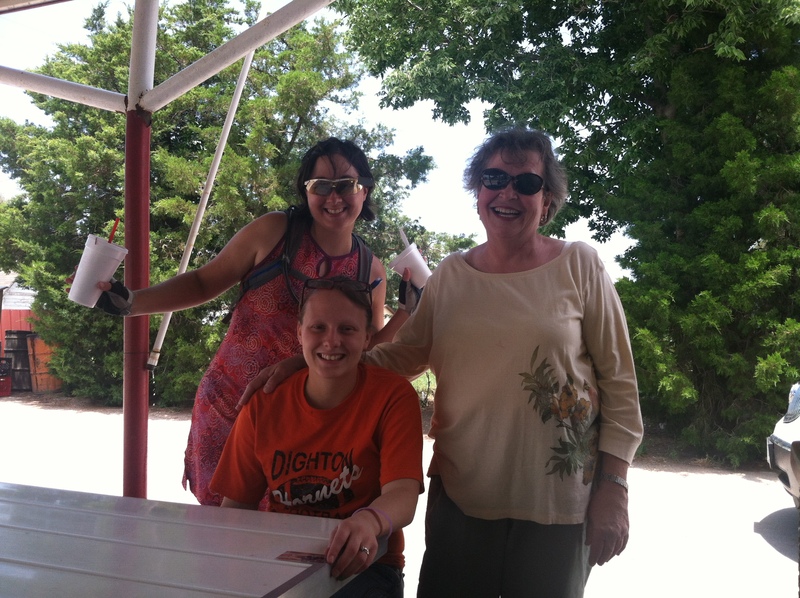 We reached Ness City, KS in the afternoon and the first thing we found was an ice cream stop. We considered where to sleep and the Derrick Motel and Inn right next door to the ice cream shop was getting tempting. The ladies at the ice cream shop had nothing bad to say about it. Linda went to see how much a room was and check the place out. To her surprise it was a very unique place with a hot tub, pool and laundry for a very good price. We took the room and got our showers. Phil was curious where the other racers were and we found out 4 racers were near Ness City from the Trans Am race tracker website. We waited at the ice cream shop until it was almost dark and met some fabulous locals. After the ice cream shop closed, we figured out the only place open was the convenience store a few blocks down. Linda started walking down while Phil decided to get his bike. 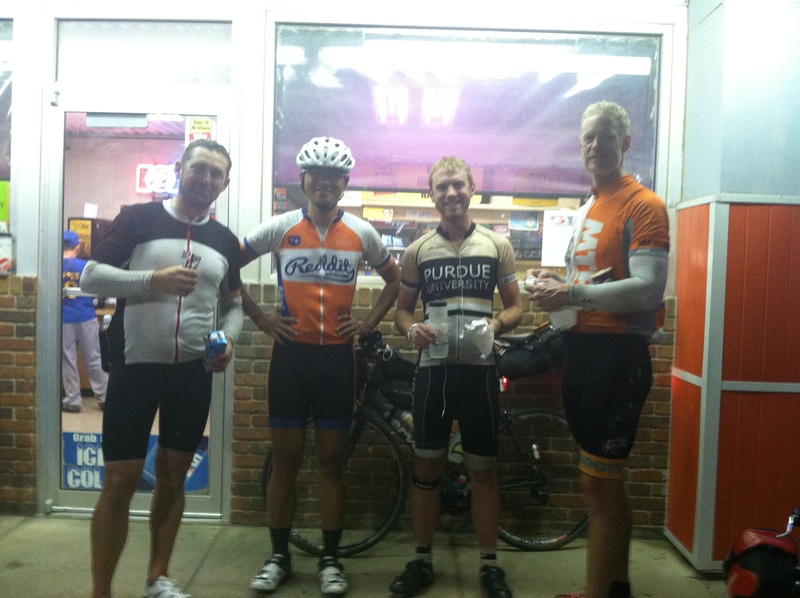 We were able to meet up with the 4 racers who stopped at the convenience store for food around 10pm. They ended up deciding to stay in Ness City at the same motel. We decided to sleep in and did not get going until after 11am. We started on our way and then realized the sky was getting very dark on one side. We started to approach a a building that we found out was a business selling trailers. Linda was planning on checking her phone for the weather when we got to the driveway, but she didn’t have too. 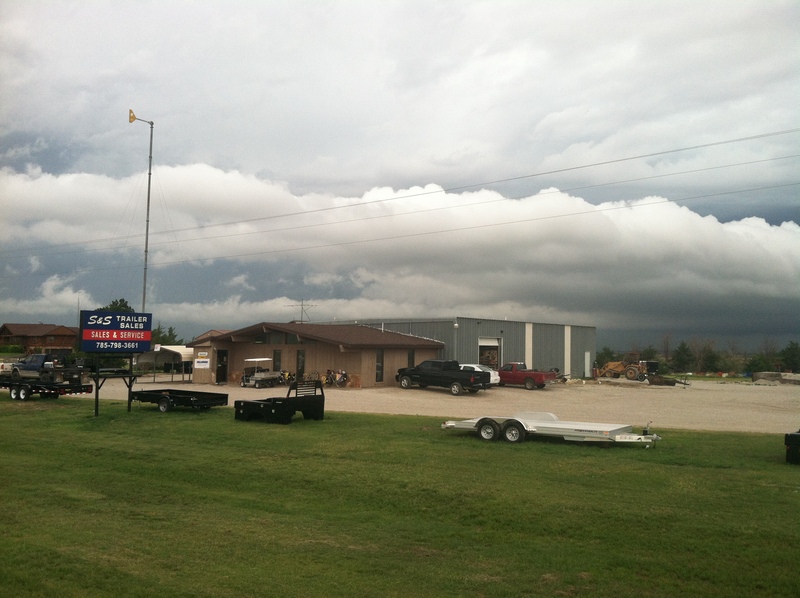 A man met us in his golf cart at the entrance to the driveway, inviting us in the building because a storm was coming with heavy rain, lightening, winds and there was a rumored tornado to the north. We graciously accepted. We hung around until 2:30 and it was still raining with lightening near by. One of the employees offered to give us a ride back into town and we accepted. 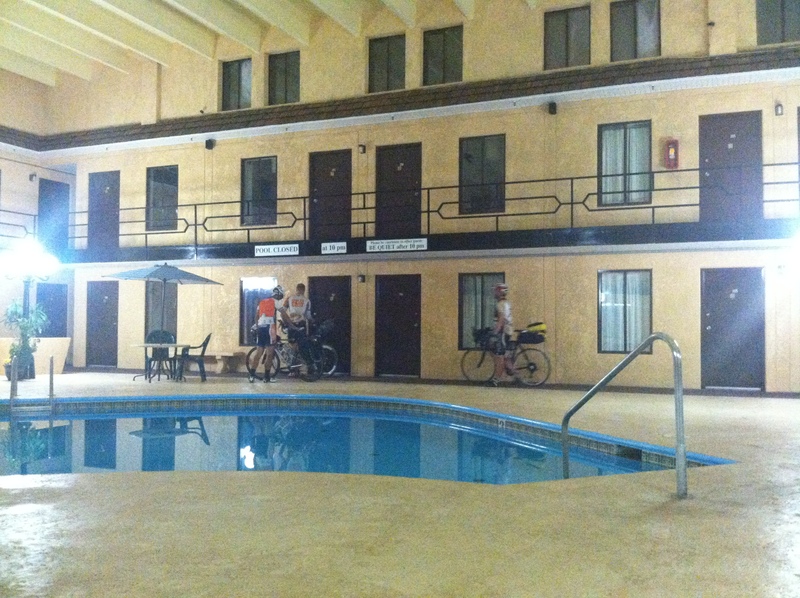 We loaded up the bikes in his pick-up truck and he took us the 4 miles back into town to the motel. 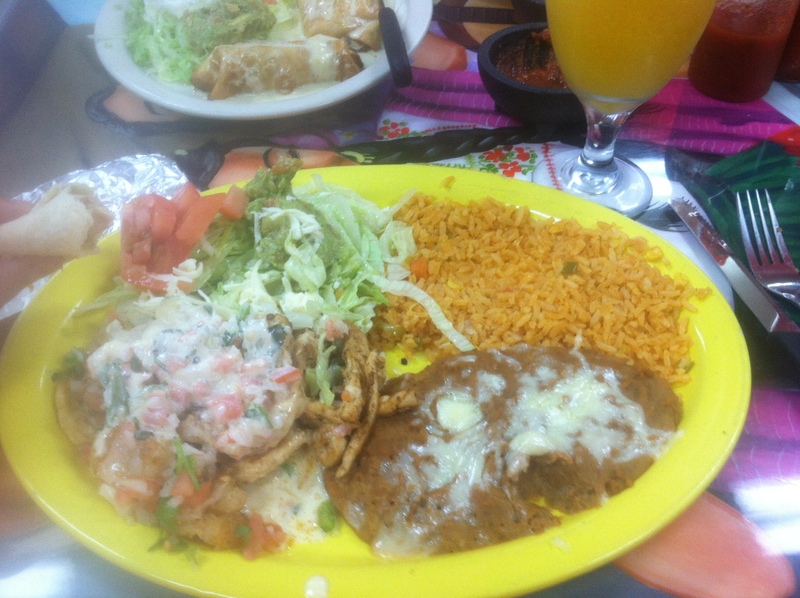 We checked back into the same room and then went to get something to eat at the Mexican place down the street when the rain died down. We were very hungry and it tasted very good. We then went back and relaxed at the hotel. We met another young man going west soaking in the hot tub. He was doing 80-100 miles/day and had gotten very sick and dehydrated. He was taking a rest day in Ness City to get himself feeling better. He was also planning on doing the Western Express through the desert to San Francisco. Linda told him to drink lots of water and to be careful. We wished him well. We got some rest and went to bed. Today we knew once we left Nickerson there would be no services for 60 miles. We started off stocking up at the convenience store and ate some breakfast there. We biked through a lot of wheat fields and with it being harvest time, we had a lot of trucks pass us carrying large farm equipment or hauling wheat. We passed through Quivira National Wildlife Refuge but did not see much wildlife. We stopped periodically to eat and drink. 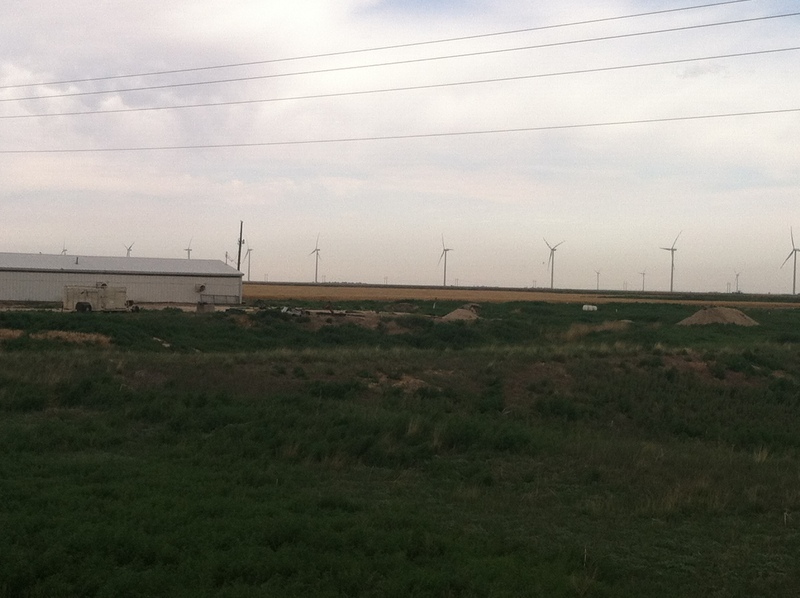 As we approached Larned, we came across our first feed yard. The smell was awful. We got into Larned, KS all we wanted to do was get some real food. There were really only fast food restaurants in town. Phil wanted Pizza Hut and Linda wanted Wendy’s. Luckily they were directly across the street from each other. Linda went and got a nice strawberry salad at Wendy’s with a Strawberry shake and large cup of ice water. Phil got some pizza. We then went to check out the city park which had a nice pool. We could camp there, but as we spoke with one of the locals we found out that Thunderstorms and 60 mph winds were going to come through that night. We decided the local motel was a better option. 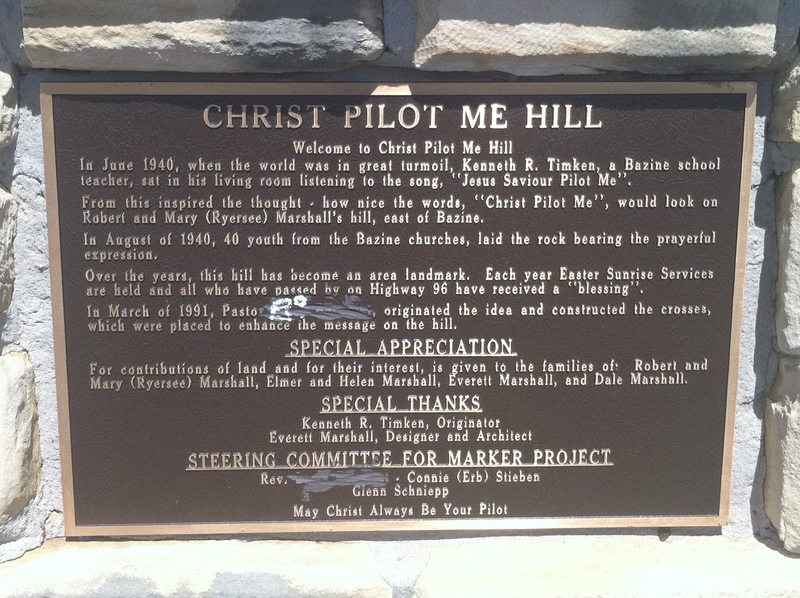 On our way back to the hotel we came across this interesting landmark. We check into the hotel and showered. We found out that the laundromat was not even 2 blocks away and got our laundry done before it started to storm. 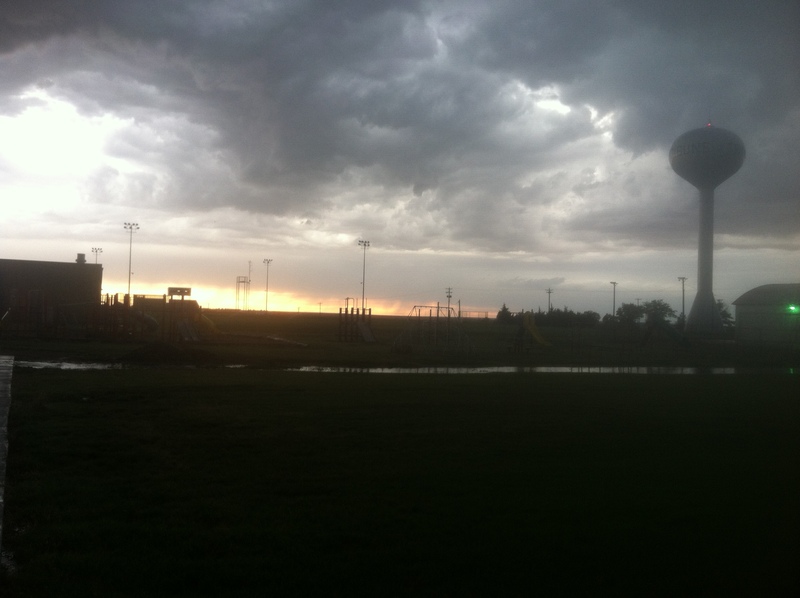 The storm did come and the thunder vibrated the motel room we stayed in. We were glad to be inside.